In the morning complete border formalities, then cross the Torugart pass into Kyrgyzstan. Arrive at the ancient Tash Rabat caravanserai, this place is considered to be one of the best preserved monuments of the Great Silk Road. This Caravan Sarai served as inn for traders. 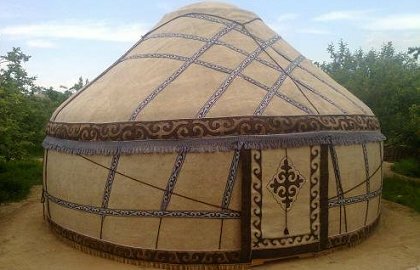 After excursion we will have tea in the yurt, the traditional housing of the nomadic people. Later transfer to Naryn. Dinner in the family. After breakfast excursion in Naryn with visitingCentral Square, Mosque. Later transfer to Issyk-Kul lake.We will have stop in Kochkor village to visit the felt workshop. 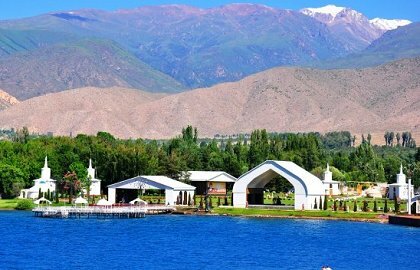 Later drive to the northern shore of Issyk-Kul lake, that is considered to be the second largest mountainous lake in the world on the altitude of 1607 meters above the sea level. Dinner and accommodation in Hotel. Full day in Issyk Lake. We will drive to Cholpon-Ata and have excursion to the Open Air Museum of Petrogliphs, the ancient petrogliphs are dated to the 2Millennium BC. Explore the beautiful lake area. Also we will have drive to Semenovskoe gorge and have a hiking here. Dinner and accommodation in the hotel. After breakfast transfer to Bishkek. On the way a visit to Burana Tower, a place on the Great Silk Road dated to 11 century. 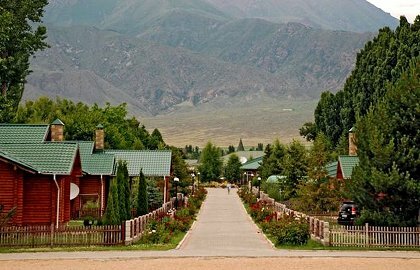 Upon arrival to Bishkek a short excursion of the city with visiting Central Ala Too Square, Oak Park, Philarmonic Hall and the Allay of the youth. Overnight in the hotel. Arrival to Tashkent International airport. you’ll be met by our guide and driver to begin the acquaintance with Uzbekistan from the very center of Tashkent. Visit Amir Temur Square ad museum, walk through quiet at this time Broadway street. At 17:50 transfer to the railway station for Afrosiab train to Samarkand (18:50 – 20:58). Transfer to the hotel upon arrival for overnight. Registan Square (XV-XVII c.). It is situated at the very center of Samarkand city. 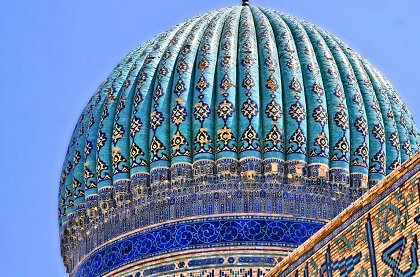 In ancient times, such name was granted to the front area of Central Asian towns, but the Samarkand Registan is the most famous of all. It consists of Ulugbek Madrasah, Sherdor Madrasah and Tilla-Kari Madrasah. 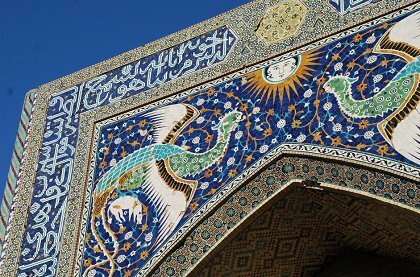 Those three madrasahs compose a unique ensemble and appear to be the one of the brightest construction of great Persian Architecture. 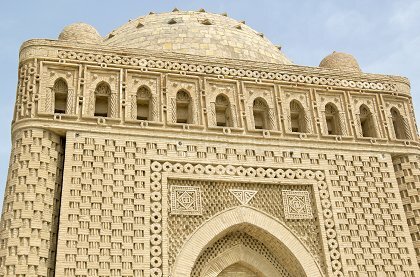 Gur-Emir Mausoleum (XIV-XV c.) – one of the best architectural monuments in Central Asia, family mausoleum for Timurids dynasty. After lunch, you’ll visit the Memorial Complex of Imam Al-Bukhari. Imam al-Bukhari is a great theologian of the East. He collected and recorded about 600 thousand hadiths – legends based on events from the life or sayings of the Prophet. The mausoleum of Imam al-Bukhari is one of the main places of pilgrimage in Uzbekistan. At 08:45 transfer to the railway station for Afrosiab train to Bukhara (09:43-11:25). Or we can organize transfer to Bukhara by car after some free time in Samarkand. 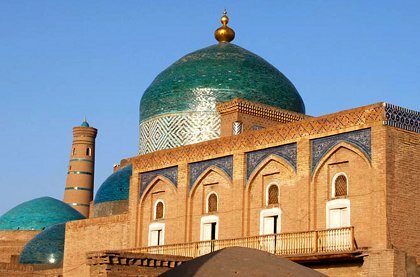 Full day walking sightseeing tour along Bukhara city: Kalyan Minaret and Mosque ensemble, Miri Arab Madrssah and Zindan Prison, Ark fortress. In the evening take flight back to Tashkent. 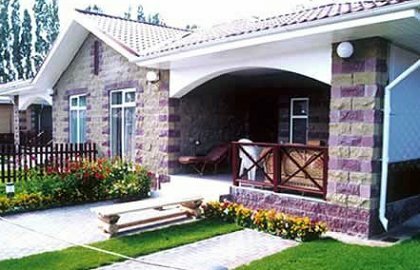 Double/twin room accommodation in hotels according the program. Porter service in hotels and airport. Level of difficulty: This tour is suitable for all people; please note that sometimes there will be 4-6 hours transfers along the mountainous roads. Conditions: If you have some specific sicknesses you need to bring own first aid kit with necessary medicaments. 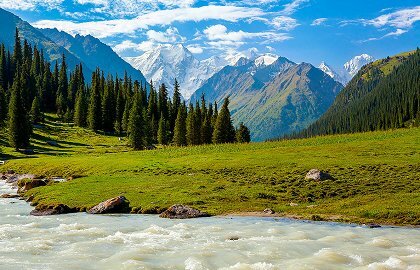 It is necessary to bring warm clothes, trekking boots, rain coat, and etc. Weight of personal things is not limited. Green hall in Tashkent airport (only for arrival). No early arrivals and late departures are included. Additional supplements could be offered depending to the international flight tourist used. Tour cost is subject to change, factoring increase in airline fare, timing, peak periods surcharges etc. Cancellation policy: 3 days before arrival 100%, 1 week before arrival 50%, 2 – 3 weeks before arrival 30%, 1 month before arrival 20%, 50 days before the arrival 0%.